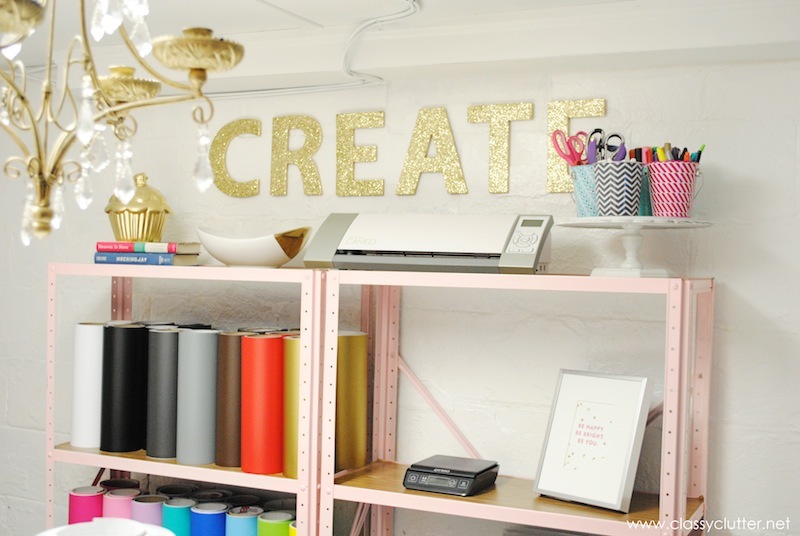 I’m super excited to give you all a little peek into my basement craft studio today. 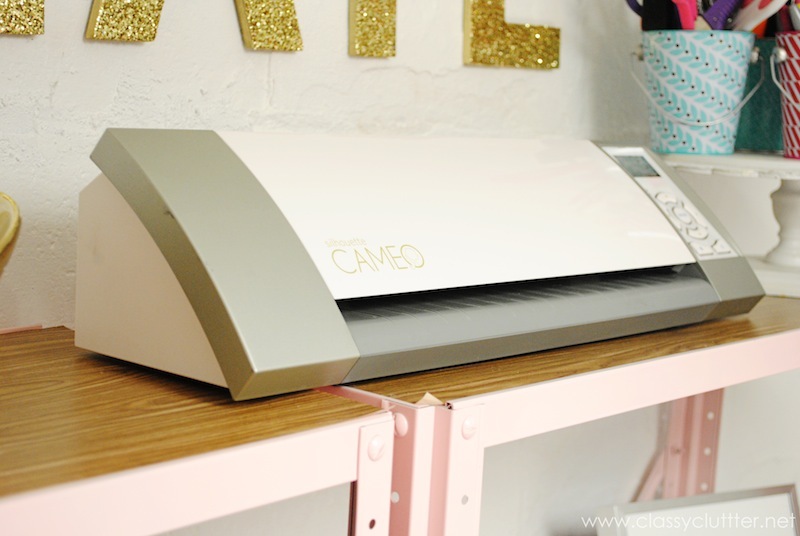 Today I’m revealing my cheap storage solution for the craft room. It’s totally not done but I’m made a ton of progress from what this dungeon basement used to be. Unfinished basements are usually scary. It’s like no man’s land down there. Like any space, I thought maybe it had potential. One day I thought I was being a genius and I cleaned up the space and put all the 80 gazillion toys in the basement. Let’s just cut to the chase.. it was total mayhem. Always a mess. Always yuck. I didn’t want to be down there, the kids didn’t want to be down there and the toys ended up making their way back upstairs. BOO! Then, I actually had a genius idea and decided to switch the playroom to upstairs and to move my craft room downstairs. I could clean up the space again, right? I emptied both rooms and the switcheroo began. 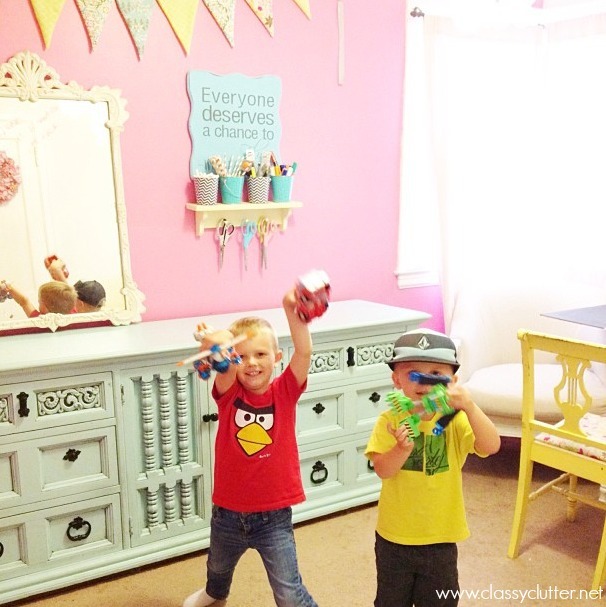 After a couple months, the playroom was done! 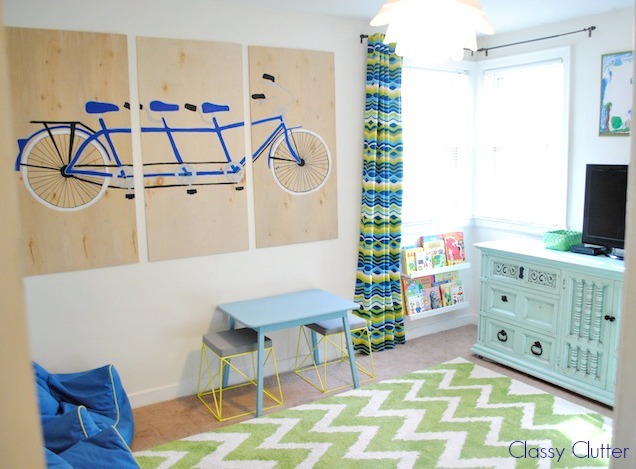 You can see the full playroom reveal here. So fun right!?! My kids absolutely LOVE it in there and that makes for a very happy mommy! Next, my turn!! Time to transform the dungeon into a functioning room. Eek!! My husband repainted the walls with this cool moisture/mold prevention paint and I repainted the already grey flooring to give it a fresh look. First project to tackle was finding an inexpensive storage solution. I needed a ton of it. I scoured craigslist for armoires, dressers, bookcases, shelving etc. It needed to be functional and cheap. 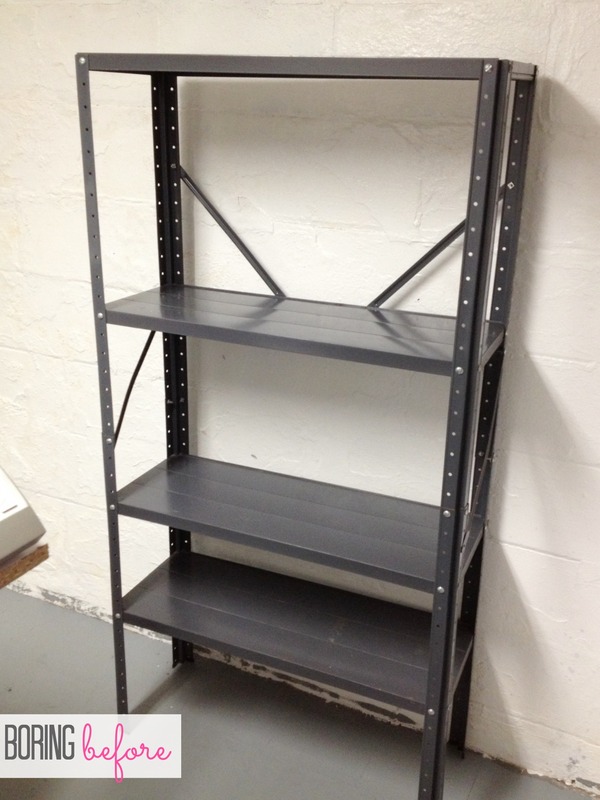 Finally, I came across 7, yes 7 steel shelving units for $25. DONE! There were 4 large and 3 huge sets of shelving. If that’s not a steal, I don’t know what is. Let’s get real. They’re pretty ugly. 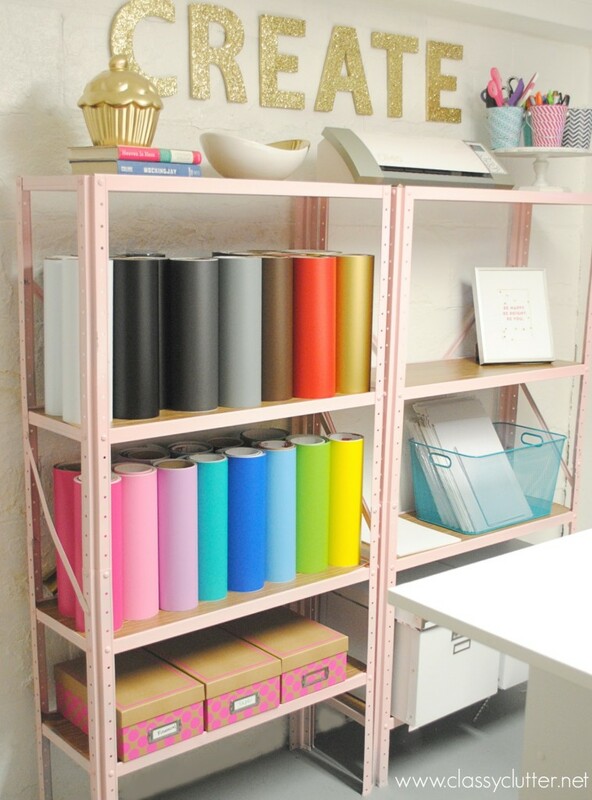 I mean industrial shelving doesn’t exactly scream girly glam craft studio does it? Enter ballet pink spray paint and wood grain contact paper. Quick Home Depot trip and bam! I took two of the units outside and spray painted two of the shelves pink. Then, I found wood grain contact paper from Home Depot and cut it to size of the shelves. Sooo much better. I LOVE how much storage it provides. It holds all of my vinyl shop supplies and shipping materials. 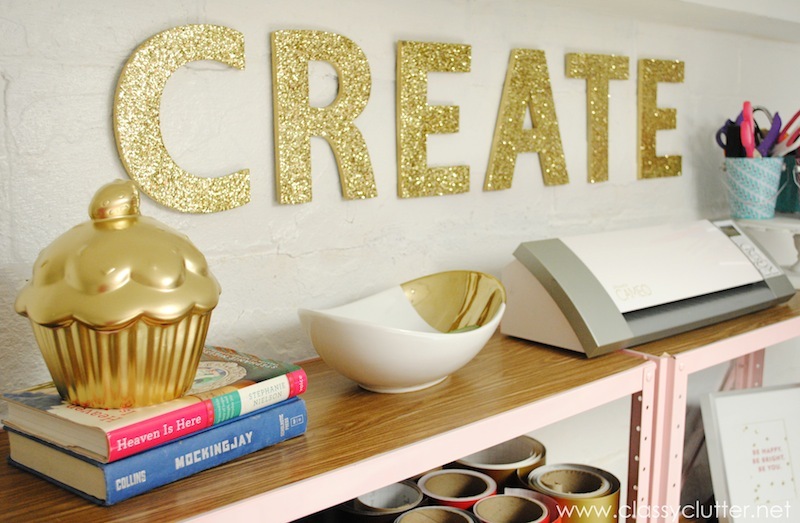 I took my CREATE letters from my old craft room and spray painted them gold. Then, I glittered them! Obsessed. 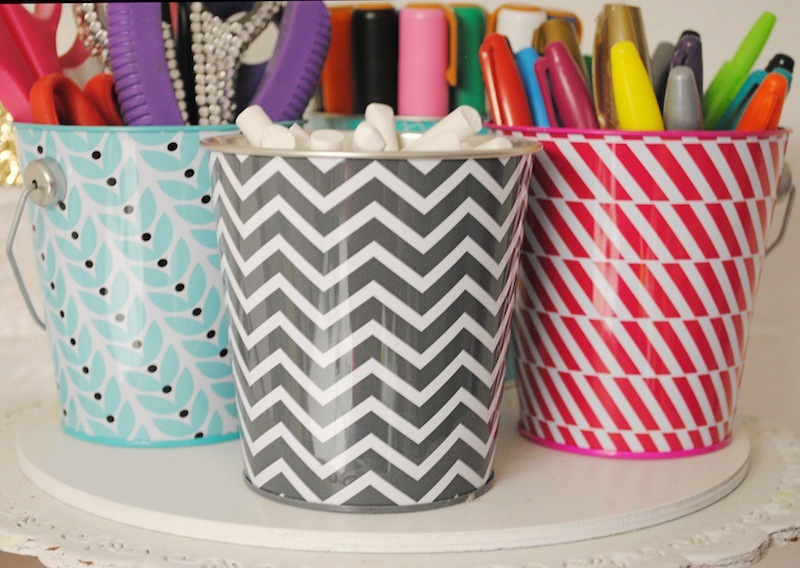 These Target Dollar Spot caddies are perfect for holding my little supplies. This is one of my faves. What is better than a gold cupcake? Probably nothing. 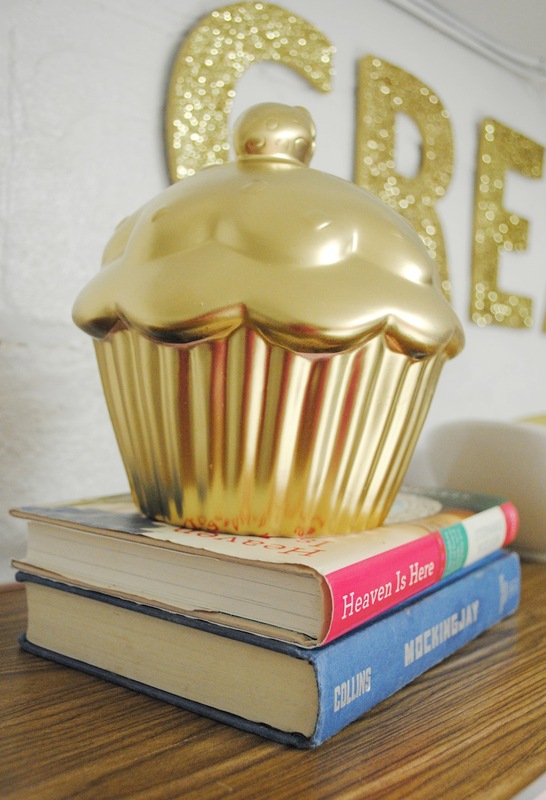 I got this cupcake piggy bank from Target and spray painted it gold. 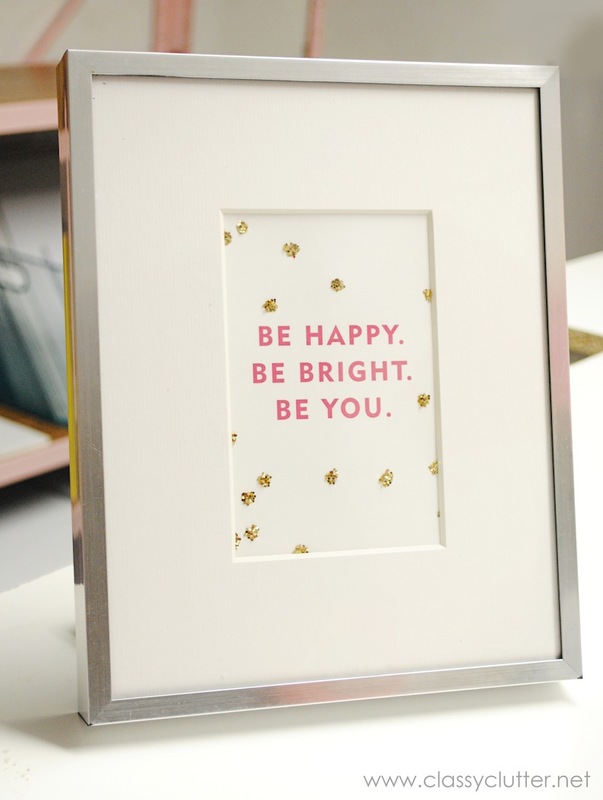 This cute little print came from a free download from Sugar Paper. I printed it and added glitter to the gold dots. How stinkin’ cute is that!? Absolutely love it! So girly and fresh and clean! BTW — do you mind if I ask what brand of paint you used on the walls? What paint did you use to paint the cupcake? So cute already – can’t wait to see the rest! Beautiful Makeover. I love the pretty pink shelves! I’m going to have to start scouring Craigslist for some ugly storage units. Thanks for the inspiration! I love the pink gold and white! It looks so clean and pretty. I really like that chandelier in that last picture too. I love your space, so cute!! I have a question though. 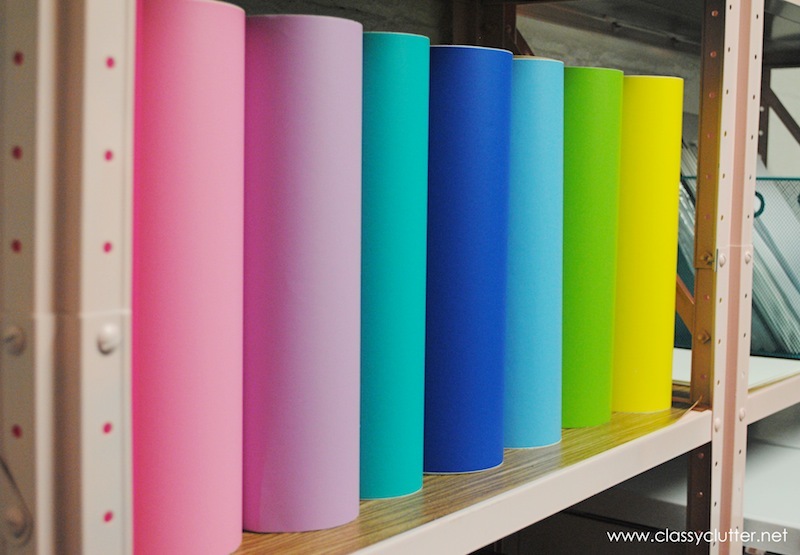 Do your rolls of vinyl come unrolled the way you have them just sitting there? Do you have them corralled in someway? Thanks. Also, I just wanted to tell you that I tried to access your project gallery and got an error message. I desperately need to reorganize my craft supplies, yours look fantastic! What a great deal on the shelves! You’ve inspired me to start Craigslist stalking! Spray painting them pink instantly made them so much more cute! Love how this room is turning out! Love this idea! We recently moved (into a bigger house with little storage space/closets/cabinets) and I’ve been trying to come up with thrift store ideas for storage. And this is great inspiration! OMG it’s so tidy how do you manage that? It looks lovely though happy crafting times in the future. Love this space and I am drooling over all that vinyl! Do you have a good source to buy from? My place just tripled their prices! I just Expressionsvinyl.com and have had great luck with them. I have been buying from them for years. Pretty sure they know me by now! lol! I LOVE how you’ve decorated! I hope you don’t mind but I took the cupcake inspiration for a party I just helped decorate, it matched perfectly! 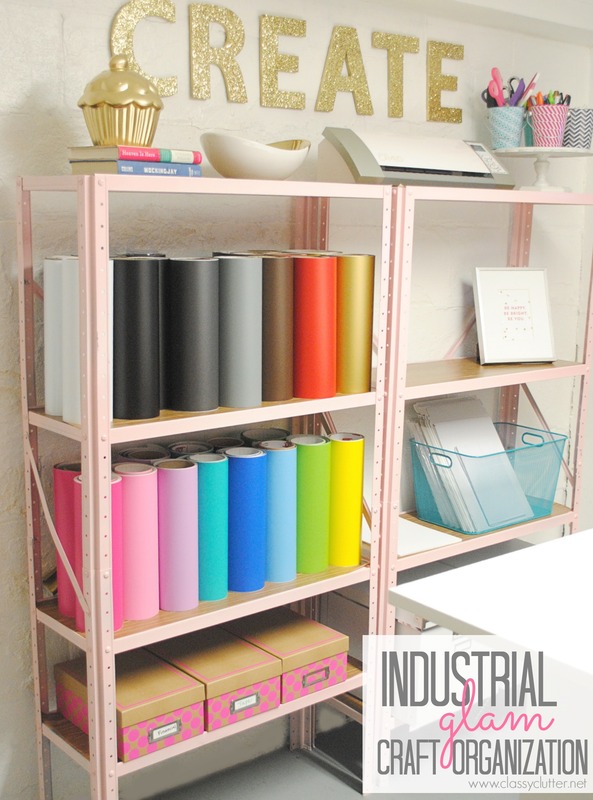 I never would have thought of spray painting industrial shelves but it makes so much sense. That is about the same pink as my walls. The walls were painted Beirs Botichelli Pink mixed with cream. It’s very soft and subtle. I still love it 4 years later. I have industrial shelves in the closet, for my craft supplies. First I need to finish my inspiration wall. But why use the paper? Is there something I need to before I do mine. Fabric mostly will be stored on them. Hi Dee! The paper was just to dress them up a bit. Totally just a personal preference. You can totally just paint them! Your blog is really interesting, dynamic and full of life! Love it!